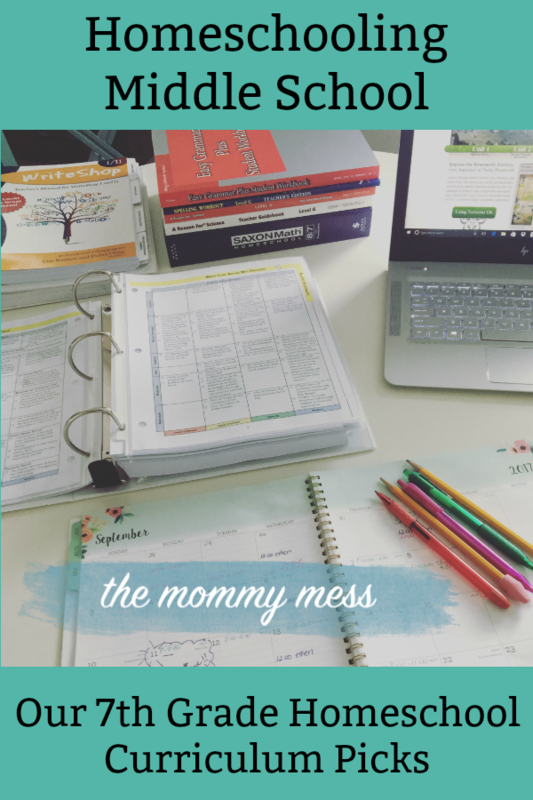 We are kicking off the school year soon at our house and I wanted to share what our 7th grade homeschool curriculum choices look like this year. It's hard to believe, but our family is heading into our ninth year of homeschooling. We graduated our oldest last spring and he's officially a full-time college student now! He's finishing up his two-year degree at our local state college and has big plans for university dorm life next fall. Take note: Homeschooling high school is possible! Our youngest son will be entering 7th grade this year and I'm super excited about our next phase of the homeschooling journey. I'll be homeschooling an only child! We don't really have a homeschooling style. I try to cover every subject in a way that works for my kids. That has looked different for each child each year. This year I'm trying some new things with my son. Here's a peek at our 7th grade homeschool curriculum picks! *This post contains affiliate links. Using them helps support this blog. Thanks for clicking through! 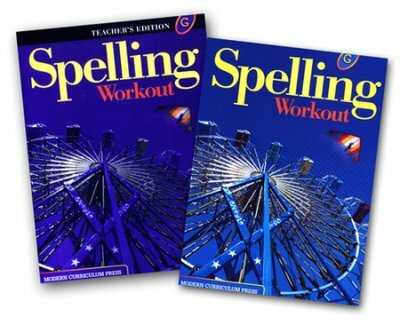 Easy Grammar Plus can be used for 6th-12th graders. It's a massive looking book with no frills or pictures. At first glance, it looks boring, but your child will like the ease of lessons. It's straightforward and not overwhelming. I like the method used to teach grammar and think it's a comprehensive program. Write Shop is another favorite of mine for this stage. 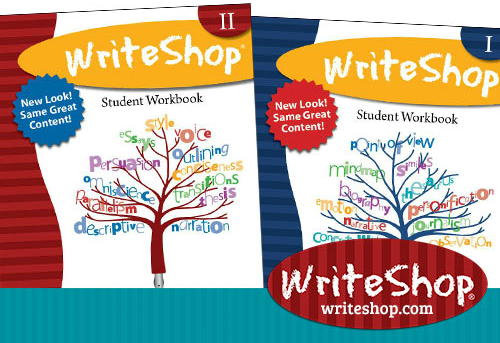 We plan to work through Write Shop I & II using the two-year plan. There's even a three-year plan for struggling writers. Love that flexibility! I decided to take (what I hope to be) a relaxed approach to both writing and grammar. Because EasyGrammar Plus andWrite Shop have a flexible pace, I plan to use two years to cover each of these programs (7th and 8th grade). I hope taking it slow will be good for my reluctant writer and help him build up his confidence and mechanics for high school writing. We've used Saxon Math with my youngest since Kindergarten. As much as I love it, I almost switched to something else this year because math is a challenging subject for me to teach. At times I feel like I'm beating my head against the wall to get lessons completed. BUT? We found Nicole The Math Lady last year and she literally saved me from a slow math death. You can read my review of her video lessons for Saxon Math here. 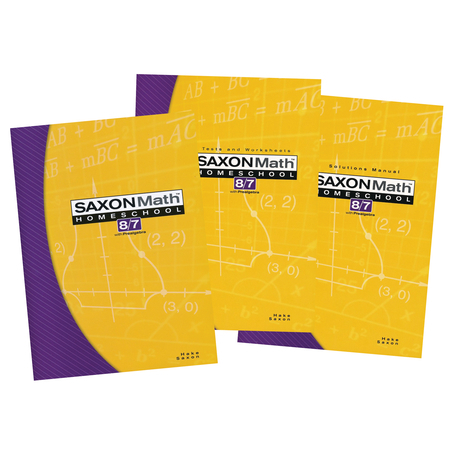 We'll be using them this year for Saxon Math 8/7, so she'll be teaching math. Not me! The membership is MORE than affordable-only $49 for a full year. We've tried other Saxon add-ons for video instruction at much higher prices and haven't found anything we like as much as Nicole's videos. We've used A Reason for Spelling,but this pick for science will be new for us. I wanted something that covered a variety of concepts and looked easy to accomplish. Check, check! They also scored points because they have a science set for the 7th and 8th grade. Hard to find! I like knowing I can use this next year for 8th grade and won't have to make any more major science decisions again until high school. Over the summer I thought about piecing together science on my own, but then I came to my senses and ordered this set. After I starting planning last week, I even went back and purchased the materials kit because ain't nobody got time to gather science supplies. Supposedly the materials kit will come with all the random things I'll need for the 36 lessons that aren't considered common household items. I did the math and the cost broke down to about $4/lesson. If I pieced this stuff together on my own, I can guarantee I'd spend more. Plus? I'll actually be ready for science experiments each week. Homeschooling science tip: buy the kit! Honestly, this is a random choice. The spelling we usually use doesn't have anything past 6th grade, so I was forced to find a replacement. I went with this workbook because the format is similar to what my son likes and I happened to like the layout of the TE. Done. I like to have a separate vocabulary workbook of some kind. We've used this vocabulary for the last couple of years and my son likes it so I keep buying it. It's pretty self-explanatory. Each word list focuses on a Greek or Latin root word. There are only 16 lessons so it's easy to add on to whatever else you're doing. We'll spend two weeks on each lesson. This is a new choice for us as well. It was a big commitment, so let's hope we like it! After planning each of the other subjects I still needed a plan of attack for reading, literature, history, and geography. I also wanted to find a way to incorporate more bible study time with my son. That's something that's important to me, but also an area I fall short. I've looked at TOG in the past and quickly ran in the other direction. Something about it looks terrifying at first glance, but after checking it out again this summer on a whim, I actually think it will be a good fit for my son. TOG uses a literature-based guided unit study approach and all of the lesson plans are done for me. Need I say more? Even though I don't feel like we fall under any one homeschooling style, this particular curriculum is considered Christian, classical. My son is going into 7th grade (in classical homeschooling language-the dialectic stage). Here's what I know about the dialectic stage: it's the green column. Seriously. Way outside of my comfort zone with this pick, but I'm also looking forward to it in a twisted homeschool mom sort of way. We are actually starting in Year 3-The Nineteenth Century. So far I have a long list of books to gather and a big huge intimidating binder. My personal goal using Tapestry of Grace: remember I don't have to complete everything recommended on the lesson plan! I can pick and choose from their plan as to what or how much I want to cover. It's one-stop shopping for history (World and American), geography, reading, literature, bible, and more depending on how in depth we take our study. I love the approach to studying history in a way that encompasses so many other subjects. If it is something that works, we can use it through high school. Here's to hoping our 7th grade homeschool curriculum picks are a great fit! Are you making big curriculum changes this year? What are your favorite picks? and share your curriculum choices!